With the mantra, “All for the love of beauty,” Joico has been pioneering revolutionary hair science and artfully blending it with innovation in haircare since 1975. All Joico haircare, styling, color and texture products fuse the latest breakthroughs in haircare science with inspiration from art and fashion to offer exceptional quality, unparalleled performance and lasting beauty. 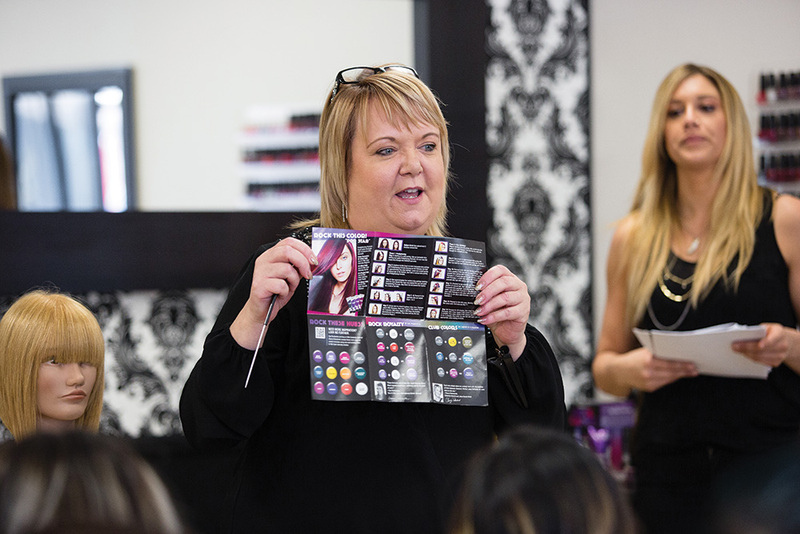 Vero K-PAK Color International Artistic Director Sue Pemberton reviews buzz-worthy products and salon support. We’re very proud of our recently launched LumiShine Repair+ Haircolor. As the original healthy hair company, Joico is known for developing scientifi -cally advanced products, and LumiShine is no exception. LumiShine replenishes arginine, an essential amino acid that gets stripped from hair during a color process, which causes hair to become dry, brittle and possibly break. By fully replenishing arginine, LumiShine can strengthen hair to bring back its healthy shine. The technology that’s used in LumiShine also gives us long-lasting color results with 100-percent gray coverage. With a pre-blended permanent cream and demipermanent liquid system of more than 70 shades, LumiShine provides colorists the easiest possible color solution for every salon service and hair type imaginable. The most valuable resource for any colorist is education, and we make sure anyone using our brands gets the education they need. Whether it’s in-salon classes, group education or online at joico.com, we have everything from the basics to trend collections. We are also very excited about our new JoiColor System Mobile App, which does every-thing from formulation to color matching and conversions. It’s a great resource for product knowledge, before-and-after shots, step-by-step techniques and how-to videos. Our company mission is to share the Joi of Healthy Hair and Color with as many salon professionals and clients in as many places as possible all over the world. Our products are created to help hair return to its strongest, shiniest, healthiest state; that belief runs through everything we do and create. We remain very much commit-ted to the salon industry and are always thinking of how to create products that help stylists build their business. A rising star in our line-up is DuoLight, 1-Step Tonal Crème Lightener. There are two versions, caramel and butterscotch, and both are fast, conditioning and give the most gorgeous soft-blonde results—perfect for those coveted balayage and sombre looks.